"Communities Blossom with OK Gardeners"
Dear Father of all sowers and reapers, Grant that we meet each time in the spirit of kindness, fellowship and brotherly love. Let our words be sincere, our vision wide and our aims unified. May we lose self in the love of beauty, service and sharing. Let us give sincere praise for honest effort, reward accomplishments and serve with open mind, ever ready to seek the best. Endow each with a smile and a kind word, with friendliness and good will. Bequeath us, O Lord, the will to think, decide, act and achieve, and O Lord, let not one in the group forget his Creator, We know thou art God. To Advance the art and science of growing plants, designing with plant materials, landscape design, civic beautification, and conservation of natural resources. To cooperate with other agencies in futhering the interest of conservation, civic beautification and environmental concerns. To coordinate the interest of the garden clubs of the State of Oklahoma in order to bring them into a closer relationship of mutual helpfulness by association, conference , and correspondence. 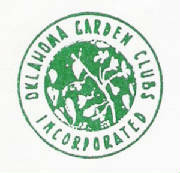 The Seal of Oklahoma Garden Clubs, Inc. The Seal of Oklahoma Garden Clubs, Inc. Combines the Mistletoe, the state floral emblem, with the Redbud, state tree. It was first designed by Mrs. James H. Gardner, member of the Tulsa Garden Club, when the organization was the Oklahoma Association of Garden Clubs. The lettering was done by Caroline Stottler, University of Tulsa art student, under the supervision of Dr. Adah M. Robinson, University of Tulsa. In 1954 The Association was incorporated, Robert Rucker of Norman, landscape design architect, University of Oklahoma, re-lettered the words so that it now reads : Oklahoma Garden Clubs, Inc.
Oklahoma Garden Clubs Inc. is a member of National Garden Clubs, Inc.
Theme: "Proudly Serving our Members and Communities"
What is National Garden Clubs, Inc.? NGC, Inc. is a not-for-profit, tax-exempt educational organization headquartered in St. Louis, MO. It is composed of 50 State Garden Clubs and the National Capital Area Federation of Garden Clubs. In addition, NGC includes 447 International Affiliate groups, ranging from Canada to Mexico, Central and South America; from Bermuda to South Africa; Europe; Australia to Japan. Within the United States, NGC, Inc. includes 49 National Affiliate groups. SOUTH CENTRAL REGION of NATIONAL GARDEN CLUBS INC.
"Share What You Grow - Share What You Know"
This was taken in the Fall. Native from central Mexico to Canada. 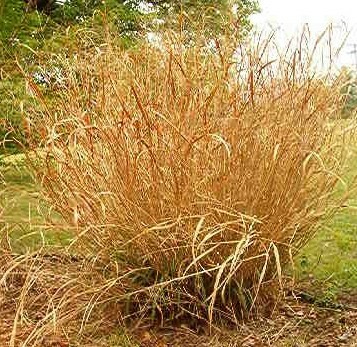 Leaves are green or blue-green in summer, reliably turning rich orange and copper in autumn, sometimes with deep burgundy tints. 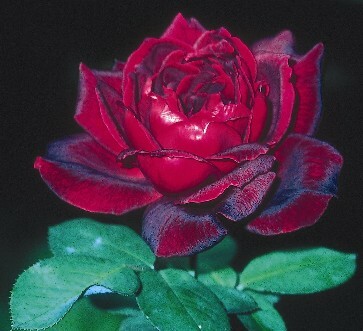 Terminal inflorescences appear in late August or early September, opening red and turning darker with age, three-parted and vaguely resembling an upside-down turkey foot.